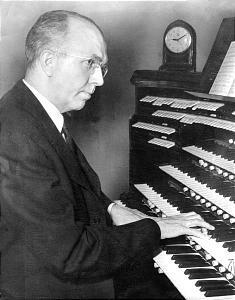 Alexander Schreiner was a renowned organist, especially well-known as an organist with the Salt Lake City Tabernacle and the Mormon Tabernacle Choir. He was also a composer. Schreiner was born on July 31, 1901, in Nuremberg, Germany. His parents, Johann and Margarethe Schreiner joined The Church of Jesus Christ of Latter-day Saints in 1903. Alexander was baptized at age eight. Schreiner began playing in public when he was five years old. He was called to serve as Sunday School organist soon at age seven. The family moved to Salt Lake City when Schreiner was twelve years old where he continued as a ward and branch organist and continued to study the organ, notably with senior Tabernacle organist John J. McClellan. He performed professionally in 1917 at the age of 16. His first job after graduating from high school in 1920 was as a theater organist at a theater in Butte, Montana. He also performed for the first time in the Salt Lake Tabernacle that year. After Schreiner served as a missionary in California, he was appointed as an assistant Tabernacle organist. He took a leave of absence to study with master organists in Paris. Of this time he said, “I might have studied compositions with Nadia Boulagier, but I felt I could not afford the time. I specialized in organ performance because I was already appointed and committed to a life at the Tabernacle.” He returned to his position from July 1926 to January 1927. He took a job as an organist at Grauman’s Metropolitan Theatre in California to pay off his debts and save money for his impending marriage. When he returned to Utah in August 1928, he was the chief organist at the Capitol Theatre as well as continuing as Tabernacle organist. The next few years would take him back and forth between California and Utah. He went to California in 1929 to recover from influenza and was appointed chief organist of the First Methodist Episcopal Church in Los Angeles. During the summer of 1930 he was back in Utah, but in the fall he became the organist of the University of California at Los Angeles. He retained this position through 1939 and spent his summers in Utah with the Tabernacle. He also served as a member of the LDS Church’s Music Committee and a member of the Sunday School general board. He also served as director of music for the Jewish Wilshire Boulevard Temple. Schreiner was the composer of several hymns in the 1985 LDS hymnal: '"Truth Eternal"; "Lead Me Into Life Eternal"; "Thy Spirit, Lord, Has Stirred Our Souls"; "While of These Emblems We Partake", "God Loved Us, So He Sent His Son"; "In Memory of the Crucified"; "Lord, Accept into thy Kingdom"; "Behold Thy Sons and Daughters Lord"; and "Holy Temples on Mount Zion". He is the author of Organ Voluntaries and Alexander Schreiner Reminisces. He regularly wrote articles for Church magazines on music in the Church that included technical suggestions for organists and music leaders. Schreiner married Margaret Lyman, a daughter of Richard R. Lyman and Amy Brown Lyman. This page was last edited on 18 December 2015, at 23:54.